I have a love-hate relationship with hashtags. When used properly, I think hashtags are extremely beneficial for brands looking to insert themselves into conversations, among other things. When used excessively, they become an annoyance and almost appear “spam-like.” A PR Daily article recap, “Study: Overusing Facebook hashtags correlates with less interaction,” directed me to this study conducted by Social Bakers and I thought it was worth sharing. What are your thoughts on hashtags? #Do #You #Love #Them #Quite #A #Bit? Or do you agree that they should be used more strategically? The article linked above discusses “experiences” with brands and whether or not a physical presence is required for a message to resonate well. My initial thought is no. I have identified and participated with many brands virtually (mostly through social media) and think that in this day in age, there might not be as much of a difference as there was a few years ago. What are your thoughts? For 48 years now, people have watched the Super Bowl. This particular Super Bowl captured my attention in a new, non-Budweiser Clydesdale advertisement way (though you really should check out this ad spot). Social media was abuzz last night with brands interacting with each other, brands interacting with consumers and consumers dishing out their (sometimes too much) honest opinions. After speaking with quite a few people today about how much fun I had watching Twitter come alive last night, I’ve decided to share a few of my favorite brand interactions and reactions. Puppies and horses are great. The Budweiser Puppy now has his/her own Twitter handle (@BudweiserPuppy) and was sending out adorable messages last night during the game. My personal favorite tweet is pictured above, sent out right after the Cheerios Game Day Ad “Gracie”, where the young daughter of a couple establishes that she is alright with a sibling as long as she gets a puppy. The tweet was even sweeter when Cheerios responded and stayed true to their branding, while incorporating the Budweiser hashtag #BestBuds. If anyone missed the Halftime Show, check it out here. Bruno Mars’ performance was out of this world awesome (personal opinion) and I always love to see my favorite band of all time, the Red Hot Chili Peppers. While I was watching the show and my phone screen (the millenial in me), I stumbled across Bergdorf Goodman‘s tweet, pictured above. Of course they have an outfit in stock that is almost identical to the outfit worn by Bruno Mars and his band, and they capitalized on that! 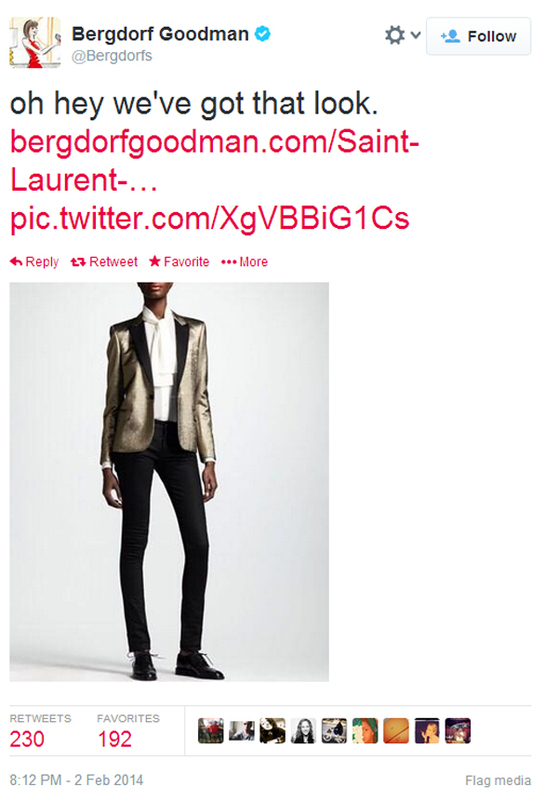 Bravo Bergdorf’s, I was laughing hysterically at this one. Quite a few brands added to the JC Penney conversation happening last night after two odd tweets were sent out. Snickers (@SNICKERS) sent out this hilarious tweet and Kia (@KIA) offered a helping hand with this tweet. After JC Penney unveiled #tweetingwithmittens, Hamburger Helper sent out a great response (pictured above). 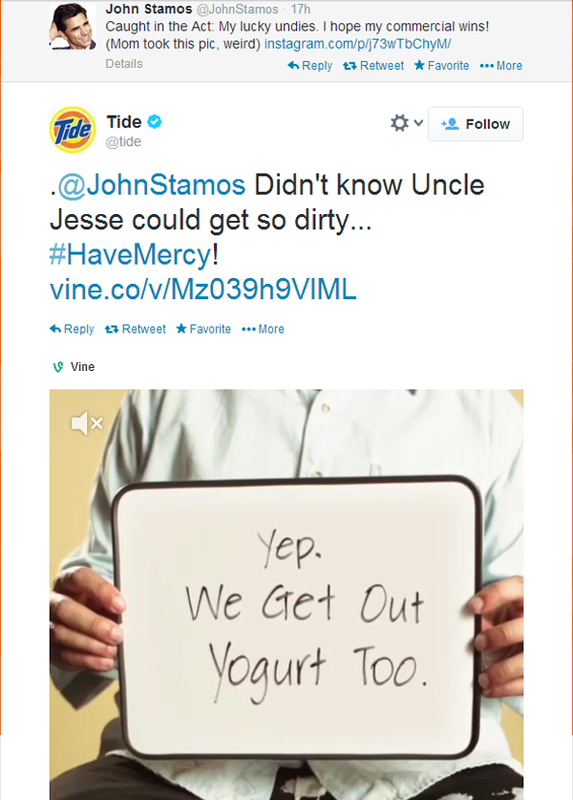 And finally, Tide, you are brilliant. Tide took it a step further last night and sported real time marketing with their Vine account and #GetItOut hashtag last night. Every time a commercial was shown, Tide had a witty, 6-second video posted, all while still managing to stay current in the conversation. While browsing through Bulldog Reporter, I stumbled upon this great article by Eric Fischgrund, the Director of Marketing and Digital Media at 5W Public Relations. The idea that stuck with me was the connotation of the word, “drone.” Admittedly, as Eric predicts will happen, my first thought about Amazon’s delivering “drones” was, “God, that sounds weird.” The idea felt uncomfortable and as I read on, I had to agree with Eric. We as a society make certain assumptions when faced with the certain words, such as drone. What are your thoughts on this article and what Eric has said? Do you agree, disagree with the idea of Amazon not using the word “drones” in their futuristic delivery discussions? And do you think that businesses/corporations need to be more careful with word selection? I found this great infographic on the PR Daily News twitter feed (@PRDailyNews), originating from the Really B2B Marketing Blog. Which of these sins do you think it is most important for a company to pay attention to? I recently participated in the Twitter chat, #TheSMGirl, and Cynthia Johnson (@CynthiaLive) mentioned this idea. I think it ties well into the idea of not “chasing followers.” There is more to measuring your social media successes than looking at traffic and the amount of followers you have gained or lost. I have come to love Twitter chats lately. It’s a great way for people to rack PR/Marketing/Social Media professional’s brains. My three favorite are #RaganSocial, #TheSMGirl and #measurePR. If you have any other Twitter chats you enjoy participating in that pertain to public relations, digital marketing and social media, please feel free to comment! New research from eDigitalResearch, discussed in an article, “Online Christmas Experiences Rated Higher Than In-Store” (via Bulldog Reporter), found that online Christmas shopping experiences rated higher than in-store experiences and 1 in 4 shoppers feel their online experience improves during the holidays while almost half think their in-store experiences worsen. Personally, I find that I tend to do most of my shopping online. If I happen to venture to the mall, I gravitate towards stores that are less cluttered and less noisy than others. But coupons and customer service will get me into the places where I might not typically go. Overall, I spend the most amount of money on brands where I am brand loyal, and not much will change that. How do you feel about holiday shopping? Do you have a better experience in-store or online?